Connect Global Loves to support local schools in Honduras. We believe that education is one of the keys to unlocking the amazing potential that is in each of us. Connect Global partners with 2 schools in La Ceiba to facilitate several students education and supplies. Thank You to our sponsors for making this school year a possible. The Kids were very happy to welcome our team. Every child deserves to get a quality education. We sponsor education initiatives and provide resources when and where we can This past August the team was able to hand out free school supplies to help kick-start the new school year. No gift to a child is too small. We all loved to be loved. Kids are not the exception they are the rule to this quote. Our team provided tangible gifts but were also able to give a hug, and a smile to let them know that We care and that God cares for them. They are special and they are blessed to be a blessing and we are happy to have been able to share this truth with them. Connect Global team members had the opportunity to show love in a very practical way at the school in El Tamarindo. Part of the Connect Global August Mission Team who brought their smiles with them. Light the Fire of education! Little Lambs Refuge in La Masica is a wonderful ministry of Proyecto Alcance founded by David and Dialis Romero. They have cared for and supported girls of all ages in a very poor area of Honduras for 18 years. Connect Global was introduced to this ministry in 2015 while Danielle, Saige, and myself lived in La Ceiba. The Connect Global Team has been supporting Little Lambs Refuge in various ways since our introduction to them in 2015. This year we had the opportunity, because of a generous friend, to send Easter Baskets full of fun gifts for them to open on Easter. You can learn more about this children's home below. Share with us your Easter weekend. Did you hunt Easter eggs, Were you at church? Did you see family? Share you stories & comments here by commenting below or email us at info@goservechange.com. 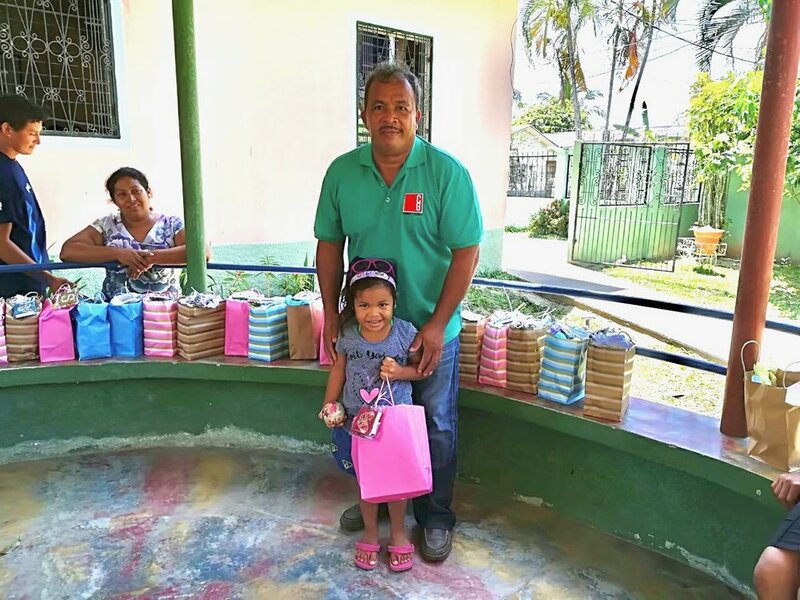 Connect Global National Director in Honduras, Jorge Amador, sharing Easter baskets with the Kids from Little Lambs Refuge in La Masica, Honduras is seen here with his daughter, Allison. A quick Post by Travis Moffitt from Honduras and the Little Lambs Refuge in La Masica. Every day we [Connect Global] are a step closer to building the Maternity Home that is so needed in La Ceiba, Honduras. I am grateful we have a team in Honduras the next several weeks with Travis N Gina Moffitt while Javier Mendoza and I share the details of the project stateside with all of you. Please give a listen to Tati describe a couple of heart-wrenching stories of moms giving birth in Honduras. We have initiated a Maternity Home Project because we know that stories like the ones we have shared here from Tati are way too common. A clean and safe facility like the one we have proposed will help hundreds of moms as they bring their children into this world. Until May 31st, 2017 we have been given a wonderful opportunity to DOUBLE our efforts. Every Dollar that is donated between now and May 31st will be DOUBLED thanks to a generous group of donors who have partnered with us! Here is a quick video we hope you will watch that our dear friends at the Little Lambs Refuge, a girls home in La Masica Honduras, made for us as a Thank You for our partnership with them over the past year. This is thanks to all who have given through Connect Global to help us support global ministries like this one and who continue to travel with us to visit and show support to communities in need. We have our next trip to La Masica scheduled for April 8-15, 2017. Please join us and help us continue to make an impact in the lives of these sweet children. Here is a quick video update from our visit to Little Lambs Children's Refuge in June of 2016. Thank you to CJ and Teri Palmer of PrepareMyMission for sharing your perspective on video for us. Connect Global was introduced to this wonderful ministry in 2015 and began a partnership in the summer of 2016 to support, encourage, and strategize with the founders on ways we can be a help to these dedicated and honorable leaders. Please read on to learn more about this special mission in Honduras. In 2003, Little Lambs Children's Refuge opened its door with an initial group of ten kids. Today, this home, officially an all-girls home with the exception of one boy, houses 18 kids from the ages of 2 to 17. The kids, in most cases, come through IHNFA (Honduras' Child Service) and come from homes of extreme poverty; abuse; extreme malnutrition; orphaned; found abandoned on the streets; or were given up by the parents. The girls live in dormitory style rooms with 2 - 4 kids per room and attend classes at, Las Huellas Del Maestro. The property the kids' home is on was an orange tree grove when David Romero bought it. There are still many of the trees standing, supplying the kids with fresh oranges much of the year. Their house mom is Marina Garcia Romero, who started working for Reach Out Orphanage since 2000. By Honduran law, the kids are supposed to leave at the age 18. But here at Reach Out Orphanage, our kids can stay as long as they need if they're being respectful, responsible, helpful around the home, studious and continue attending church. Reach Out Orphanage Inc., most commonly known as Proyecto Alcance, is a certified 503(a) non-profit organization. Located in La Masica, Atlántida, Honduras, Proyecto Alcance is a faith-based ministry the preaches the Gospel of our Lord Jesus Christ, with special focus on reaching low-income children and their families, helping them with their spiritual, physical, educational and material needs. David and Dialis Romero founded Proyecto Alcance and the Little Lambs Children's Refuge in 2003. Connect Global is proud to be partnering with this mission. Founded by Missionaries David & Dialis Romero, whom received God's call, in July of 2000 left their family and amenities in Florida, to move to the country of Honduras, to be a blessing to many families and children who smile today because the have known God's love through this ministry. Proyecto Alcance, localizado en La Masica, Atlántida, Honduras, es un ministerio de fe que predica el Evangelio complete de nuestro Señor Jesucristo, con enfoque especial en alcanzar la niñez de escasos recursos, ayudándoles con sus necesidades espirituales, físicas, educativas y materiales. Fundado por los Misioneros David & Dialis Romero, pareja que al recibir el llamado de Dios, en julio del año 2000 dejaron a su familia y las comodidades en el estado de la Florida, para llegar al país de Honduras, para ser de bendición a muchas familias y niños que hoy sonríen porque han conocido el amor de Dios atraves de este ministerio. So grateful for the opportunity to attend the annual Rosebud Fair. The team handed out approx. 800 bottles of water to the historical dancers, and performers. The history and heritage we were able to witness was very powerful and passionately displayed. Thank you to all who made this trip possible.